I have been immersing myself in the ins and outs of product design recently, and have become obsessed. I think I’ve always been a believer in the power that great products can have to impact people’s lives, businesses and the world at large. After diving deeper I’m even more convinced. Below is what has come to be the basis for my views on building great product experiences. It is based on what I’ve been reading and educating myself with, some of which I’ve included to underscore key points as I go. I really hope you find this useful, and celebrate product obsession with me. As many do, I believe that design is the most important aspect of creating a desirable product. In the past, many companies used to be able to get away with using branding and advertising to create artificial desire, based on pop-psychology insights. That’s really no longer possible. As consumers have become more savvy, as products have become more complex and as advertising has become increasingly ignored, it has become incredibly difficult to create demand in an artificial way. This shows up in our consumer culture’s immense shift away from the long-standing mass market brands of the 20th century. — Alexander Obenauer quoting the IDSA’s amicus curiae submission to the Supreme Court of the US for the Apple vs Samsung case. It has long been possible to win with a focus first on product design. I have a favourite quote from from Joanna Hoffman, former CMO of Apple, about how she views of the process of marketing. To me, it really underscores a great view of the power of product design, given all of Apple’s successes (for the life of me, I can’t find the link to the interview now, so apologies… I’ll heavily paraphrase here). Apple is a tired example of greatness in product design, but this perspective is definitely worth sounding like a band-wagon / broken record here. Desirability — how much does a target customer want to use the product? Viability — how does the business make money and be/become profitable? Feasibility — how can the plan and the technology be executed? Is it possible? For users, the experience isn’t just about the time spent actively using the actual product, it’s about the holistic process of a thinking about and completing the ‘job’ that (s)he is hiring product for. As such, we need to think about all aspects involved, in order to truly create a great experience. Each element above needs to work together to create value for the user with regards to completing the ‘job’ (even if simply in the form of entertaining content related to the product… ex: the oft cited Dollar Shave Club video below). The more value the whole experience creates for the user, the more they will love the product… and the more they’ll come back to use it again… and the more they’ll be willing to pay for it… and the more they’ll choose it over a competitor… and the more they’ll tell their friends about it… all creating mass amounts of value that the company can capture in the exchange. Bingo! 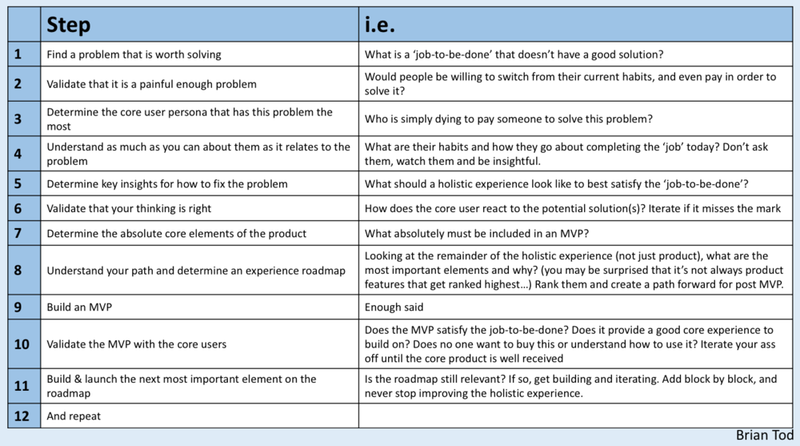 The process by which to create a well-designed holistic product experience is not an easy one, and there are a great many models to do so. Below is a summary of how I see the steps. It’s definitely high-level and absolutely an over-simplification, but I think it’s a good starting view of the world. I definitely suggest exploring deeper if you really want to internalize how to get this done. Given my thesis is around the need for holistic product experiences, I really want to hammer home how the above makes that happen, and therefore differs from a more simplified approach. First is the need to think holistically when describing and validating the potential end-solution. That means not just the core technical product, but all elements of how a user thinks about and completes the job at hand. Second is creating a holistic roadmap that includes all of these aspects, and using it to guide your post-MVP development roadmap. Also, it’s important to remember that even though we’re using this process to think through a very full solution, Rome wasn’t built in a day. I’m too big of a believer in the Lean Startup methodology not to tell you that you shouldn’t try to create an entire holistic experience in one shot. Use lean thinking alongside experience design to build and validate in small, purposeful chunks that take you down a path that creates the holistic experience you envision. And be sure to tweak the path as you learn more (always be learning more and more as you go)… just keep the full system-wide experience in mind as your goal. Designing a great holistic product experience takes focus, diligence and creativity. It is part art and part science, and it is not easy to do. That said, we’ve all seen the amazing impact that a well-designed product experience has on us as users. When we find one, we rave about it. We talk the ears off of anyone who’ll listen. We become obsessed… and the company that provides that experience to us benefits greatly as a result. It is a commonly held belief that the key for creating a great product is a passionate focus on creating value for the user, and I completely agree. That said — and to bring this back up to business design (desirability, viability, feasibility) — I want to leave you with something that I also believe to be true: you have to focus on creating the type of value for users that you’re able to capture some of to build an actual business, otherwise you’re just doing charity work… (and I don’t believe that advertising is a good solution — except for Facebook — as it often erodes the value you’re trying to create for your users). This is, of course, unless charity is your goal, and then hat’s off to you. Hope you enjoyed this post, and took something useful away from it and/or the articles I linked to. Really appreciate you reading.